The process of washing and waxing a car is a science second only to changing a tyre. Taking care of your car's looks is much like an elaborate skincare routine. The process of washing and waxing a car is a science second only to changing a tyre. In fact, we're tempted to put it on the top of the list because changing a tyre requires just brute strength, while the former requires oodles of patience. Here's a run-through on how to keep your car shiny and pretty. Start with spraying the wheels and slathering them liberally with tirefoam, so you don't get slop all over the body of the car. To remove the gritty layer of grime coating the vehicle, hard scrubbing is not the way to go. Save yourself the common mistake of using laundry soap or household cleaners, which can strip your car of wax or damage its paint. Car wash products are pH balanced and gently loosen contaminants when applied with warm water, without affecting the coating. It's recommended that you give your car this treatment weekly, but you can cheat your way through cleaning sessions with a spray-on detailer. This takes care of light dirt, but offers no protection. Waffle-weave microfibre towels are the best option for giving your car a rub-down. Lambswool mitts are also good for your car because they draw paint particles away from the paint. Re-dip the mitt after wiping down panels of the car to ensure that you're working with fresh suds each time. Dry the surface with a terrycloth or chamois towel. You're not done yet. Your car may be beaming out of sheer gratitude, but it still has a long way to go. Run your hand over the surface of the car. If it doesn't feel as smooth as glass, it could be the combined effect of tree sap, bird droppings and the ultra-abrasive acid rain. 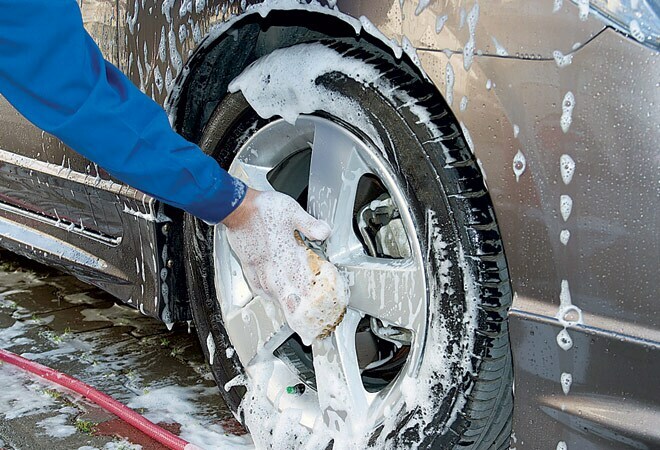 Use a clay bar to gently knead over sections of your car in small, circular strokes. Wipe off the remnant with a towel folded over twice. Synthetic polymer-based waxes offer longer-lasting protection. Pick this over carnauba-based waxes. Treat your car to this once every three months.